Sweepstakes Winners know entering sweepstakes is fun, but the real fun is winning, right?! Just like the lottery, when you enter, you get a chance to dream about what you’ll do with the prize or who you’ll take with you if you win that big trip. The power of those daydreams keeps you entering again and again. When you win, you join a special group! The sweepstakes winners who entered through our site are announced in our winner’s circle. We’d like to take a few minutes to give them their time in the spotlight here. Our Sweepstakes Plus subscribers have a habit of winning cool prizes over and over again. 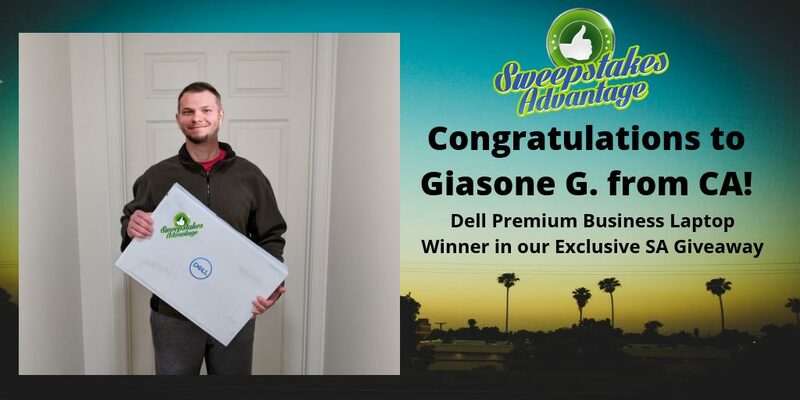 Giasone was California dreaming of a new Dell Laptop so he entered our SA exclusive giveaway. He was selected randomly as the winner. Here is a picture of him with his new Dell Laptop. SA always has many exclusive giveaways. Go to our main page and see the gold banner. This is actually our second Robotic Vacuum prize that we have awarded on SA. These little vacuum robots are really a big time saver, especially if you have animals. If you have animals and don't vacuum daily your allergies will go crazy. 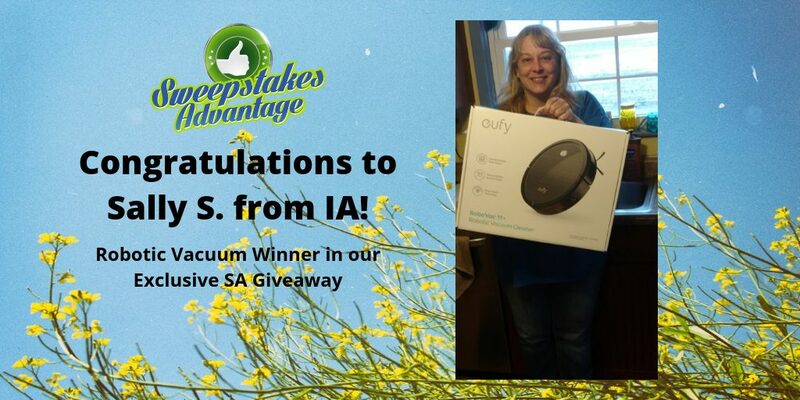 We are happy to announce Sally from IA as the winner in our latest Robotic Vacuum Giveaway. No more back breaking old vacuum! 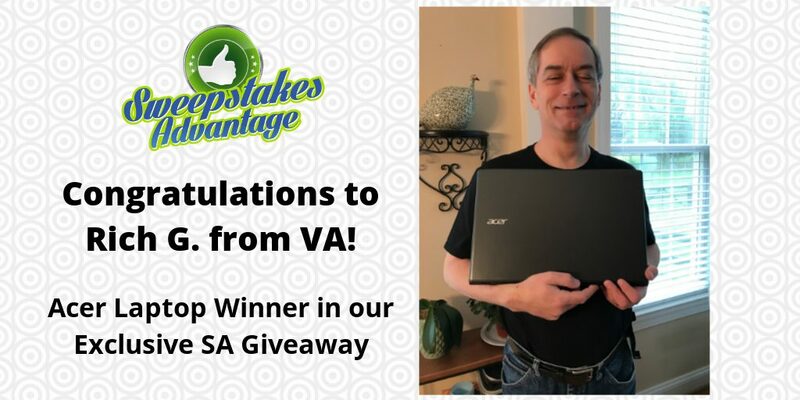 Sweepstakes Advantage member Rich G. from VA was the winner of our Acer laptop giveaway on Sweepstakes Advantage. The best part about this win is that Rich said he was in need of a new laptop for years. It's really awesome when people win prizes that they really need. Congratulations to Rich. Every so often one of our members is able to score a big sweepstakes prize. Kool is a known sponsor for many big name promotions. Member Cin999 recently won the first place prize which was $25,000 in the Kool Kash instant win sweepstakes promotion. The Grand prize in this promotion was $100K! There were many other prizes as well in this Instant Win game. I'm sure there are other members who won one of these many other prizes. A big congratulations to member Cin999. Furniture is one of those things that always needs updating or replacing. Especially if you have kids, animals or both! There are many furniture promotions on SA every month. One recent one was from Sobro. Our member faithmsweeps was the Grand Prize winner in a Sobro Smart Coffee Table Giveaway. The coffee table was valued at $1,500! Sobro looks like a great company looking at the feedback from their company that was posted in our winner circle forum. Congrats to faith. Plus subscriber +archidis99 will be getting a good night's rest. Around 3 weeks ago they became a Grand Prize sweepstakes winner, which includes King size cooling mattress, cooling pillows, comforters, performance sheets, etc. This all Got delivered last week and they call this prize awesome! They were talking about getting a new bed, awesome timing on this win! The Grand Prize value was from this Sheex promotion was $2154.00 to $3133.00. Biking is becoming very popular due those new electric assist bikes. Not having to peddle so hard, especially up hill is a god send. Sweepstakes Plus subscriber +dugpenz Won 1 of 50 new bikes from a Miller Coors sweepstakes promotion. There are 49 more Martone Bike prizes up for grabs in this Miller Instant Win promotion. What are you waiting for? Have you tried winning something for your kids that they really want? It's great when a plan comes together. Bryan is very thrilled to be a winner. His kids have been wanting a Nintendo Switch! He is thankful to be a winner. He actually just signed up for Sweepstakes Plus in April 2018. There are many more sweepstakes prizes like this to be won. Sweepstakes Plus subscriber oldyella just won the Samsung Virtual Reality Headset. ARV: $130.00 in the DORITOS® Jurassic World: Fallen Kingdom “Track. Rescue. Win.” Promotion. This member is liking this game a lot. Just last week they also won the Samsung Tablet ARV: $549 playing this same game. This promotion ends on June 30, 2018. Hurry and try your luck. We tried something a little different for a giveaway prize because grilling season was coming up. 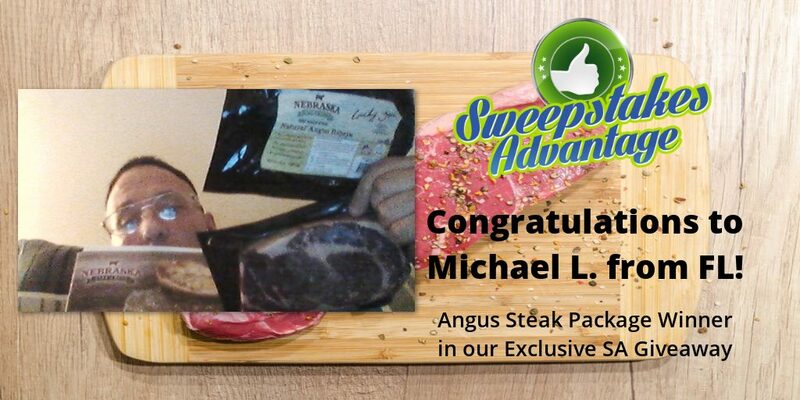 Sweepstakes Advantage decided to giveaway an Angus steak package. It actually took two tries to declare a winner because the first winner never confirmed. Another reminder to everyone to always be checking your email for prize wins and this includes your spam folder. Congratulations to Michael L. from FL! He was the winner in our Angus Steak Package Giveaway. We hope he enjoys the bountiful amount of steak headed his way. Plus subscriber +gotb21 and his wife entered the Grand Prize club. They submitted their entry for the American Standard Walk-in Tub Giveaway that ended on April 24th. During the Carey Brothers Radio Show “On The House” on May 19th, they were called by James Carey and told they were one of 3 finalists for the Walk-in Tub. After they talk to James, Doreen from American Standard tells them about the tub during the radio show. She gives them a shock and says that they won the Walk-in Tub! The Walk-in Tub includes installation is valued at $17,500. Suzanne his wife entered him to win it. Because of this, she gets a $500 Visa gift card! The total value of the prize is $18,000.00. This is their first win as a Plus Subscriber after joining and entering for about a year! They thanked Sweepstakes Advantage for listing all these giveaways! The amazon echo is a very popular gadget. In our house we never thought to get one until we received an echo as a gift. It comes in very handy if your hands are busy doing something and you need an egg time or want to know the weather or a thousand other things! Our Sweepstakes Plus member +mykidzrock01 won an Amazon Echo in the nextbigfuture.com giveaway. Plus subscribers have a particular advantage to win these gadgets because they can search for “echo” and see the full result that includes local giveaways. More chances equals better odds of winning. Sometimes many of our Sweepstakes Plus subscribers win the same prize. Every so often it's a great prize. Members +sweepsgirl887 and +descango both won a $500 Dicks Sporting Goods gift card. They both entered the My Grizzly Proving Grounds Sweepstakes. The winner notification came in email. Be sure to always check your email carefully for prize wins. You may ask yourself, what do DC Comics and Lobster have in common? No, there is not a new super hero called Lobster Man. Plus subscriber +skater425 recently won 2 Grand prizes. This member was 1 of 3 grand prize winners in the Lobster Roll With Raeburn Sweepstakes. The prize was a $175 Hancock Gourmet Lobster gift card. They were addition the grand prize winner in the DC Comics MAD Prize Pack Sweepstakes. The prize included a DC Collectibles Batman statue and other collectibles. Is there no hope for Lobster Man? Stay tuned. Have you ever heard the expression, things always happen in 3's? SA member bata99 is very in tune with this saying. This member reports on the SA website that they won 3 prizes in 3 days. They won a hat in the Eagle One Ultimate Garage Makeover Sweepstakes. They then won A pair of sunglasses from Marlboro and for #3 won a $30 Movie E-Code! This was a online sweepstakes prize trifecta. Congratulations to member compmend. This member entered the MakeSpringCount Johnson & Johnson ZYRTEC Make Spring Count Instant Win & Sweepstakes and won. The prize was a $100 Home Depot gift card. There are hundreds of instant win prizes available in this promotion. Better enter today because it's ending soon. We always tell people who are in a prize winning slump to try and enter promotions where there are thousands of sweepstakes prizes. Getting a little something in the mail on a regular basis can help keep you motivated until the major prize win happens. Sweepstakes Plus subscriber +sweepsyana just scored a MillerLite Canny Pack prize in the latest MillerLite promotion. There are thousands of these Canny Pack prizes that MillerLite is giving away. Get out of the slump and score some cool little prizes! SA really loves to give away cooking prizes. People don't realize how much of a time saver instapot pressure cookers are because you can start with frozen food. 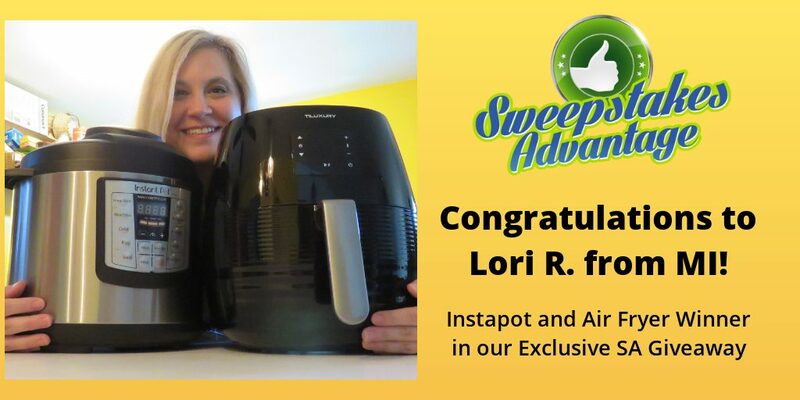 Lori R. from MI won an instapot and air fryer in our recent giveaway. I think I'll cook something in the pressure cooker tonight. Congratulations to Sweepstakes Plus subscriber +sides58. This plus member won a $500 visa gift card in the North Carolina Beer Sweepstakes. This promotion had four winners and all received a $500 gift card. This one only allowed one entry. You have to enter to win. Sweepstakes Plus subscriber +1280 Won the king of all sweepstakes prizes, a new car. They re posted on our SA winner's circle June 16, 2018 that they won a 3 day trip to Concord NC as a finalist. As the grand prize finalist in the Lund International Super Charged All American Car Sweepstakes they won a highly customized 2017 Dodge Challenger! The total ARV of the Grand Prize was $67,000. It's OK to be jealous. Sweepstakes Plus member +cosmic8o8 on Monday was notified that they won the Acer Swift 3 in their AcedIt giveaway. The following morning they got a call saying they won a Tecate Chivas jersey. Yay! It's been a good week for member +cosmic808. We love to hear about all types of prize wins. Keep those winner posts coming. It's good Karma. Kristine has a sunny outlook on her prize winning future. 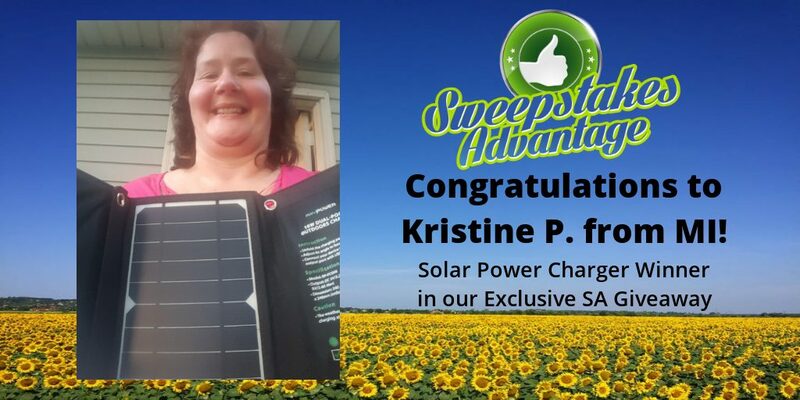 She was the winner of our Solar Panel Charger giveaway. This cool solar panel can recharge a cell phone using only the power of the sun in just 1 hour. Totally amazing gadget. Will come in very handy during the next power outage or storm. 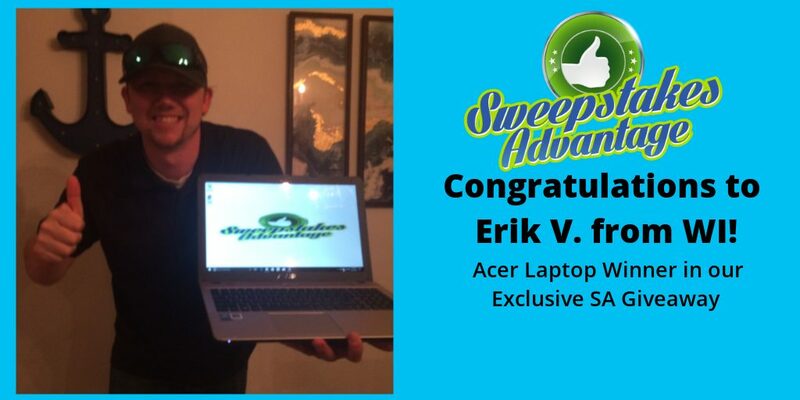 Sweepstakes Plus subscriber Erik V. from WI has been borrowing a laptop because his own laptop is too slow. He admitted to us that he hasn't been entering too many sweepstakes lately because he has been busy. To his amazement he was selected as our Acer Laptop giveaway winner. Sometimes one entry is all it takes! It's the time of year to barbecue just about everyday in Florida. You can get really creative cooking outdoors the whole year long. Smoking meats and food has really been modernized in recent years. The electric smokers really make this an easy thing to do. Steven C. from NJ was a Deluxe electric smoker on our Sweepstakes Advantage giveaway. See his picture below. 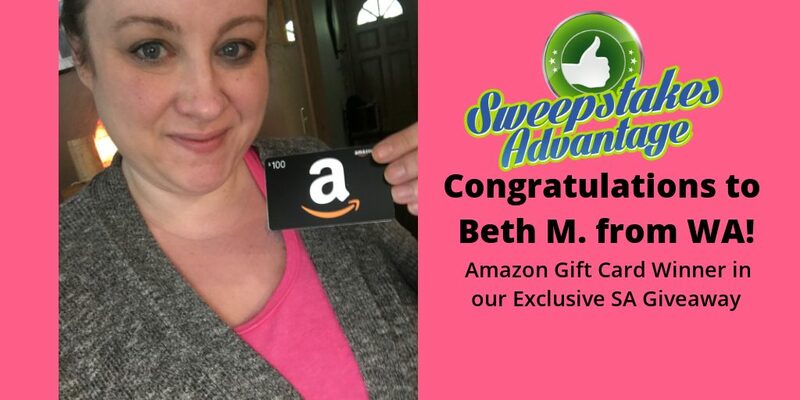 Beth M. from WA subscribed to the Sweepstakes Advantage Newsletter and was randomly selected to win a $100 Amazon gift card! SA will be picking a new gift card winner each month. Yet another reason to join the greatest free sweepstakes newsletter online. Plus subscriber +angel_believer used to enter a lot of sweepstakes but went back to college and there just wasn't enough time for everything. Just started entering sweepstakes a few weeks ago and they have an amazing win to share. This member was the big winner in the MLB/Shark week grand prize! This Grand Prize includes flights for two to D.C., two nights in a hotel, two tickets to the MLB all star game, two shark week prize packages, and $500 cash. It's really great when you win something useful like a grocery gift card. Miller Lite has a current promotion and quite a few of our members are reporting in with gift card prize wins. Congrats to members +sarasara1, +angel_believer and moombeamer81. They all won pre-paid gift cards to buy some groceries with in the Miller Lite sweepstakes. Member sweepstakesgen just started sweeping again these past two weeks after a long absence. It was a good plan because this member won the Chasin' The Sun Sweeps grand prize. They will be awarded a trip for two to Panama City Beach, FL with paid 4 day/3 night hotel or condo stay. The total ARV for this Chasin' the Sun Sweeps grand prize was $5000. Congratulations to Sweeps Plus member +cneshe. The Big Green Egg won't arrive for 6 – 8 weeks but +cneshe won a large Big Green Egg and Eggcessories thanks to Boulevard Brewing! These Big Green Egg grills are especially a popular prize among our members. Congratulations to Sweepstakes Plus member Ellen L. from WA. 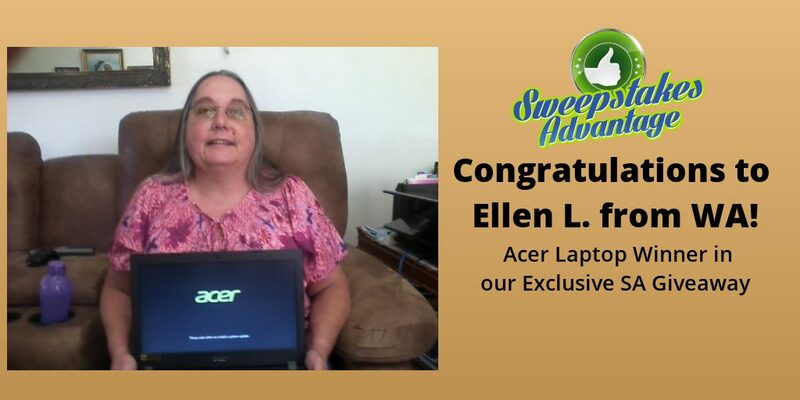 Ellen won a new Acer Laptop in the Sweepstakes Advantage giveaway. 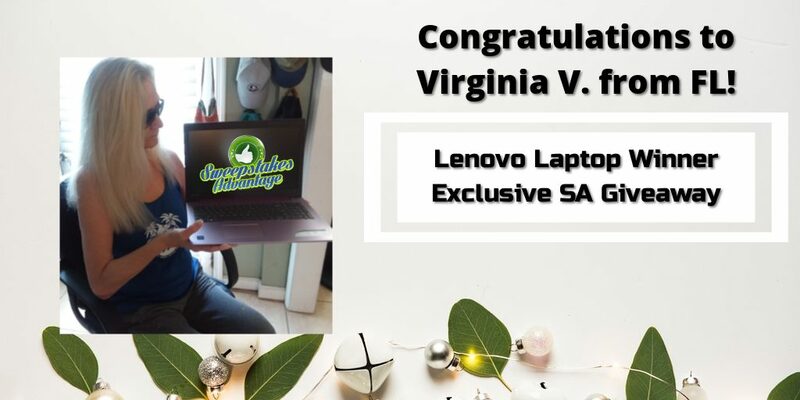 SA gives away 2 laptops each month. You can find the giveaways listed on the main page of our site. Good luck to this month's contestants. Sweepstakes Plus subscriber +oldyella scored the elusive lime symbol as well as the other 9 symbols to have their choice between a number of cool trips or a $4000 gaming package. This member chose the Cool Off. Heat Up Experience. The Winter DEW Tour with VIP access and chill with DEW Pro Snowboarders. This prize includes a round-trip coach air transportation for two (2), one (1) double occupancy standard hotel room for three( 3) nights, two (2) VIP tickets to DEW Tour, ground transportation and $300 spending money. Estimated retail value up to $4,280. Plus member +davisesq was the Grand Prize winner in the Stella Artois San Diego Food & Wine Flyaway Sweepstakes. They found this sweeps listed on SA and it was a one time entry! The actual trip is on November 2018 to San Diego, California for the San Diego Bay Wine + Food Festival. The trip prize includes air, hotel, ground transport, tickets to the event and a debit card. Congratulations to member +daviseq. A big congratulations to Plus subscriber +dannagm216. This member was a grand prize winner in the Rockstar/TimeWise Husqvarna Sweepstakes. The Grand Prize was a Husqvarna FC350 dirt bike. The total ARV of the Grand Prize dirt bike prize was $9,299.00 USD. The really cool thing is that this grand prize was one of many in a text entry sweepstakes. Plus subscribers have exclusive access to our text entry sweeps list. Congratulations to Sweepstakes Plus subscriber +beat1. Member beat1 actually won this back in January but due to some glitches (long story) they finally received the cookware last Friday. They received 2 pieces, a skillet worth $199 and roasting pan worth $249 in the Camille Styles Sweepstakes. Member beat1 never had cookware quite this expensive! Beat1 also won their 3rd Amazon Instant Win the same morning they posted this win. The amazon prize win was a Low noise hair dryer. I always wanted to be a Farm Star. Farm Star Living is a company that celebrates farming. It has the most extensive resource of locally sourced farm to table restaurants across the USA. The Farm Star Living celebrates farming, farm-fresh foods and healthy living. It's a great thing to support american farmers. Member mrsheila won a $500 Visa gift card and a big bag full of Farm Star Living products in the Farm Star Sweepstakes. This is a healthy prize win. Do you hear that echo? 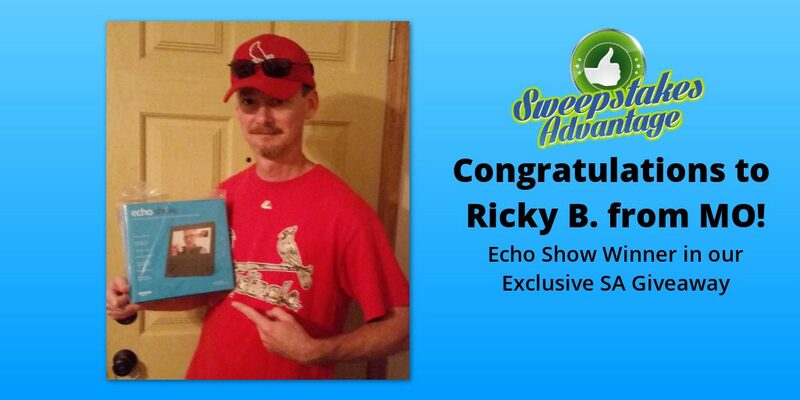 Sweepstakes Plus member Ricky B. can hear the echo. Ricky won the all new Amazon Echo Show in our latest SA giveaway. 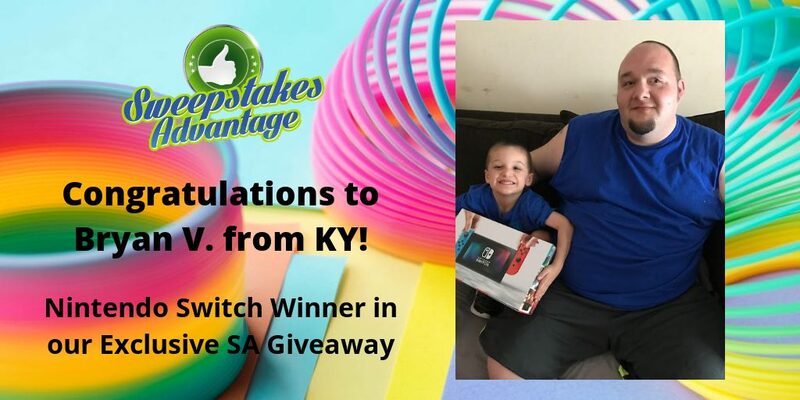 Ricky has won many prizes from the sweepstakes listings on SA and is a long time member. He told us that he feels like SA members are like a family to him. Glad to have you in our family. Sweepstakes Plus subscriber +southside2354 has announced their grand prize win. The Bohn Audio Giveaway Grand Prize was and Apple Ipad 3 /64gb, Bohm 66 headphones,Apple 42mm watch and Bohm Impact wireless speaker. Sounds like a fantastic electronics grand prize. Congrats to this Plus member. Sometimes you just need a new Dell Laptop. 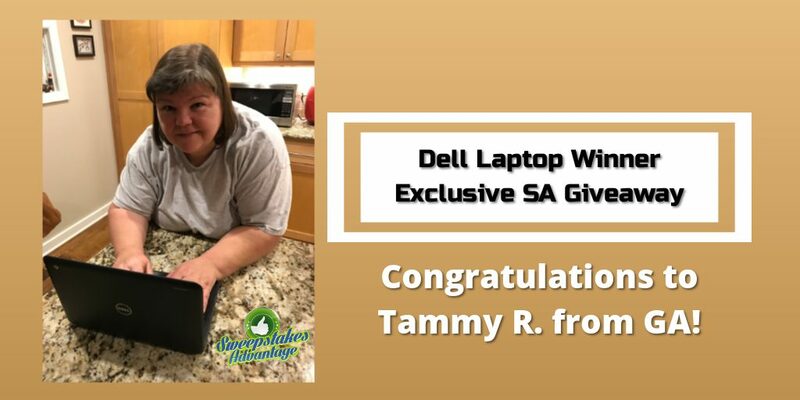 SA gives away 2 new Laptops every month. 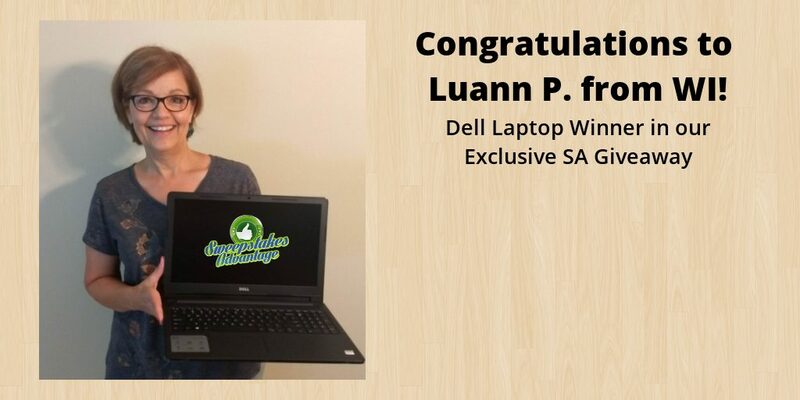 Sweepstakes Plus subscriber Luann P. recently won a new premium Dell laptop. It's easy to enter. Just search for laptop on our site and enter our daily entry sweepstakes. Congratulations to member xlcarthen. This member requested a code to play an instant win game and was surprised to see a win. The Victra Dream Instant Win game popped up and alerted about a $1,000 Victra Gift Card prize. They’re also entered for a chance to win the $1,000,000 grand prize. Did you know that you could win prizes just for being a SA newsletter subscriber? David M. from NJ won his first prize ever and it was from SA. The prize was a $100 Amazon gift card. 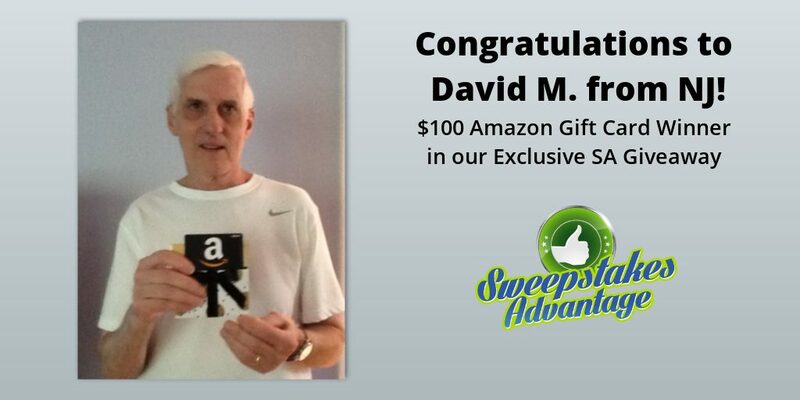 David says the Sweepstakes Advantage prize is much appreciated from one Retiree. Everyone loves to shop, especially when it's free. 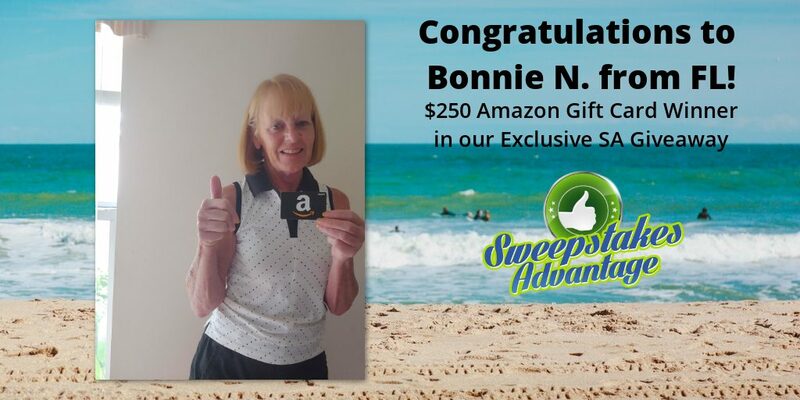 Sweepstakes Plus member Bonnie will be doing some free shopping on Amazon. She won a $250 amazon gift card from SA. Maybe you will be the next giveaway winner? You have to enter to win. In today's times almost everything you need to do is online. It's actually necessary to have a laptop or computer. 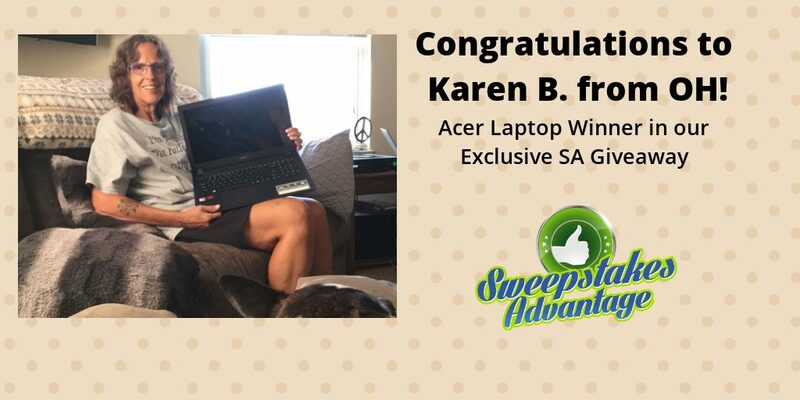 We are happy to announce that Karen was our latest Acer Laptop winner. She told us that she thinks her new laptop is so wonderful. 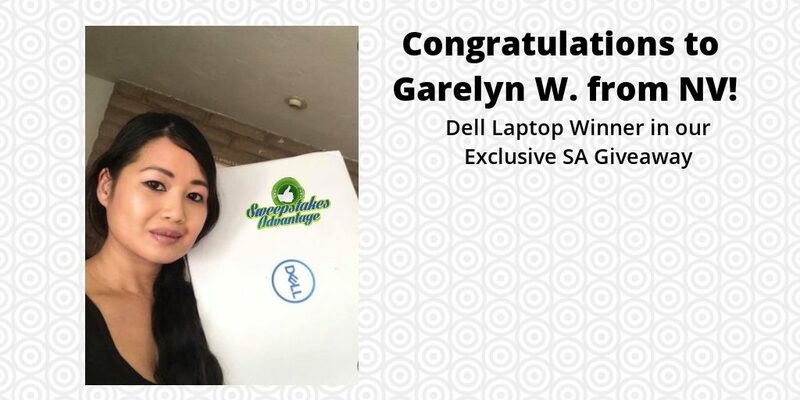 Garelyn is very appreciative for winning a dell laptop computer. It arrived at the perfect time as her daughter is just entering University studies. They were in need of a good quality laptop. This member has an aptitude for winning sweepstakes prizes. 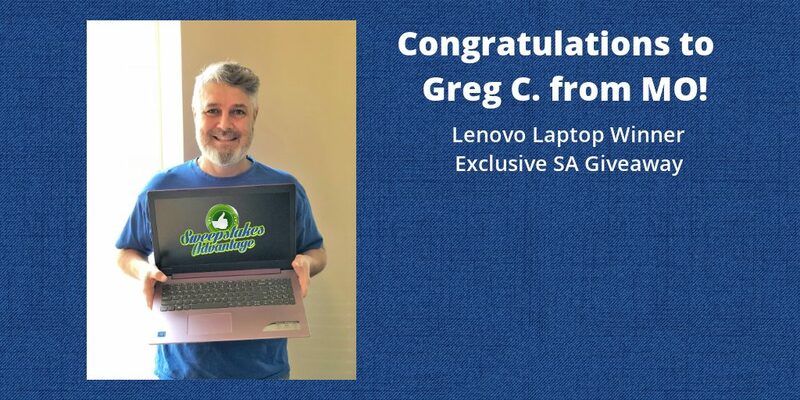 Greg is a busy guy and somehow he still found time to win a new Lenovo Laptop. It just goes to show you that it only takes one entry to win. Congratulations to Greg on his sweepstakes prize win. 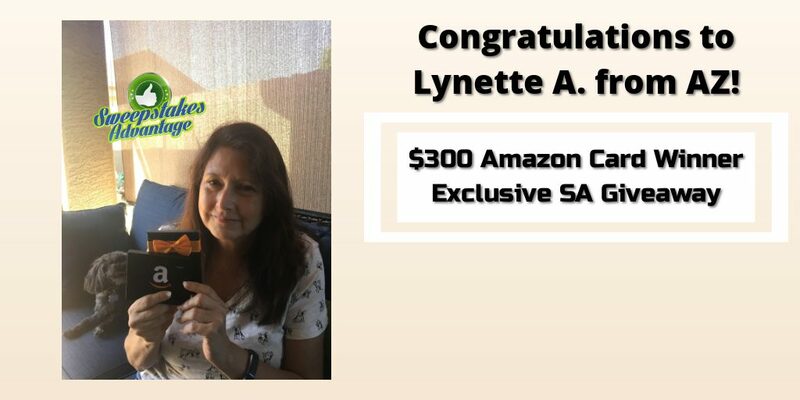 Sweepstakes Plus subscriber Lynette A. from Arizona will be ready to do some shopping with her little dog. 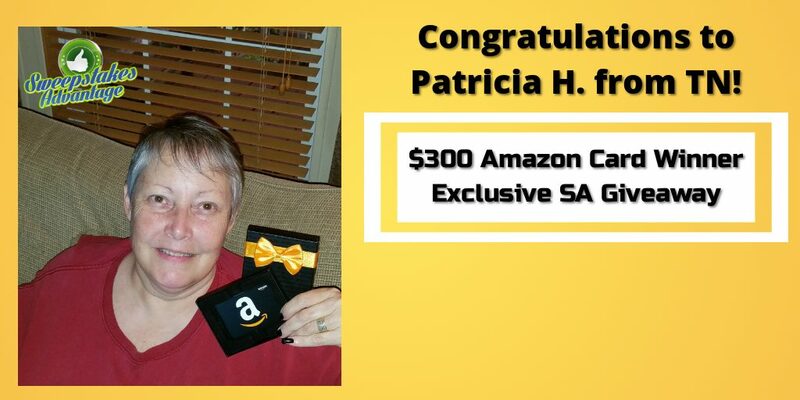 She won a $300 amazon gift card in the last exclusive SA giveaway in September 2018. 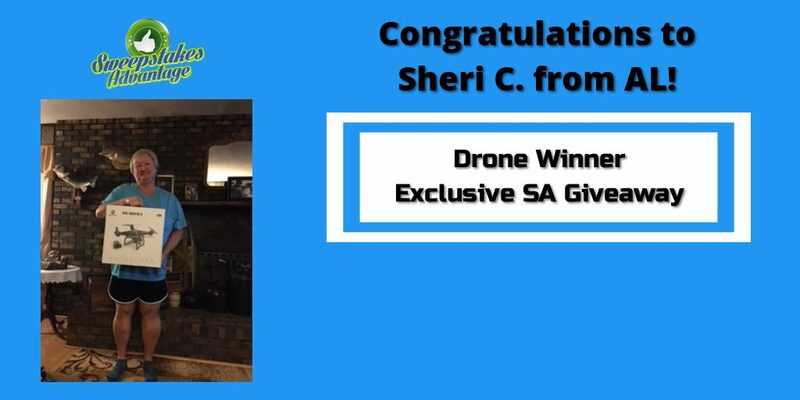 In our first drone giveaway Sheri C. from Alabama was the winner. Drones can be used for many things and now Sheri will see all they can do. Congrats to our latest sweepstakes winner. 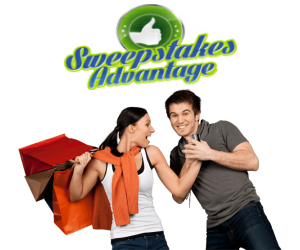 Check the Sweepstakes Advantage main page for our recent exclusive giveaways. 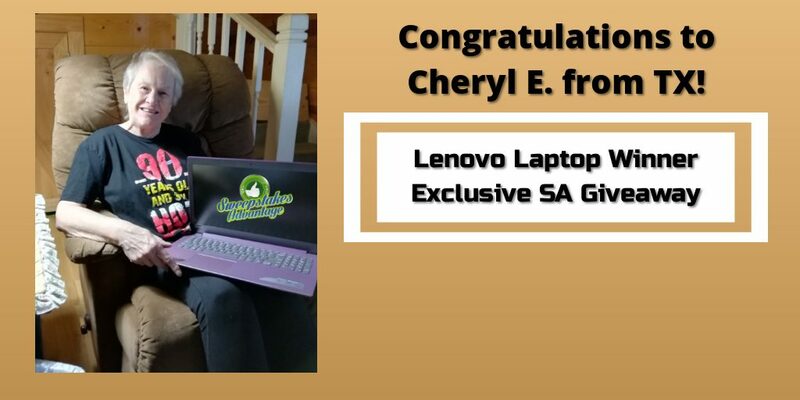 Cheryl said she had to get up from the floor when reading she was the winner of a new Lenovo laptop. We love it when we see winners that are truly excited by their wins. SA gives away new laptops every month. We hope you are the next sweepstakes winner. Patricia has been a SA and Plus member for years and loves the site. She won a $300 amazon gift card in the perfect time to purchase Christmas gifts. It's a great time to be entering sweepstakes in 2018. We have seen a big increase in prizes compared to other years. Member noliewootang was notified that they were the grand prize winner of their local fox tv station. They won a trip to 2 to Los Angeles, CA for 3 nights to sit in on table read with the cast of Modern Family. What an amazing local sweepstakes prize win for this member. Sweepstakes Plus subscribers have access to many local sweepstakes. Virginia V. from Florida was surprised to learn that show won a laptop. Imagine how fast she'll be able to enter sweepstakes now. A Lenovo laptop is great because you can enter sweepstakes anytime and anywhere. SA gives away new laptops every month. Sometimes you don't expect a prize win and it comes completely by surprise. 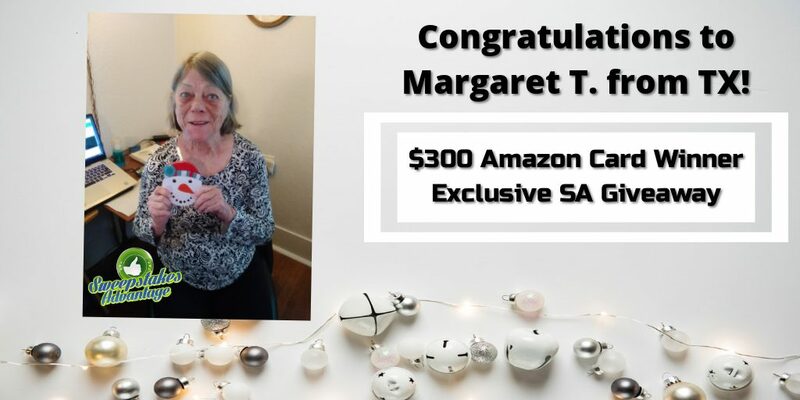 We don't think that Margaret T. from Texas expected her prize win at all. She won a $300 Amazon gift card just in time for Christmas. We think a free sweepstakes prize is the best surprise of all. Good luck to all in our future sweepstakes giveaways. What is the best way to start off a new year? 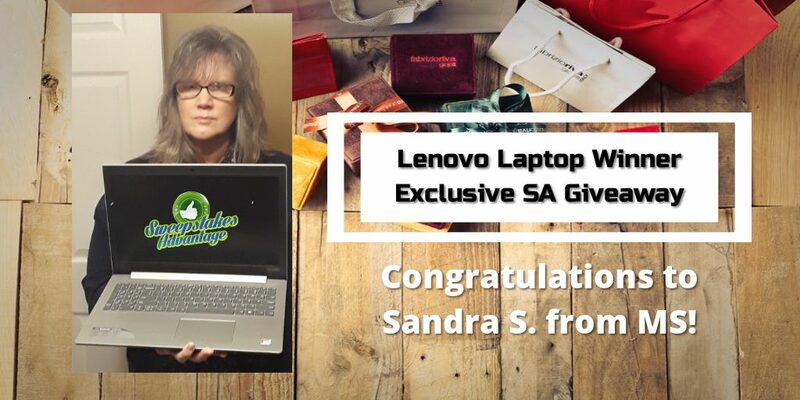 In January of 2019 Sandra received a new Lenovo laptop prize. Sandra is quoted saying that she enjoys the website and is really glad she upgraded to Plus. We hope to see many more sweepstakes winners in 2019. Tammy says she loves Sweepstakes Advantage and she can't believe she won. Her new Dell Chromebook is a great little laptop. Chromebooks are actually a great laptop for sweepstakes entry because they are very simple to maintain and use. They also come with free built-in antivirus. Want to join the club of sweepstakes winners? Check our site daily for new sweepstakes you can enter! Wow, a lot of really nice prizes! I am not a plus member yet but when I clicked on the entry option to give plus members their extra points it entered me for that entry. Like I said I am not a plus member yet but the lines are overlapped for some reason and I couldn’t read it all and could not tell what that entry actually was until I clicked on it and read from the page it took me to. Just wanted you to know I did not take this entry intentionally. No worries. When we pick a potential winner we validate who is a Plus subscriber and who is not. So many very nice prizes! I am so glad I found this site!